Summer means free music in Goodale Park! 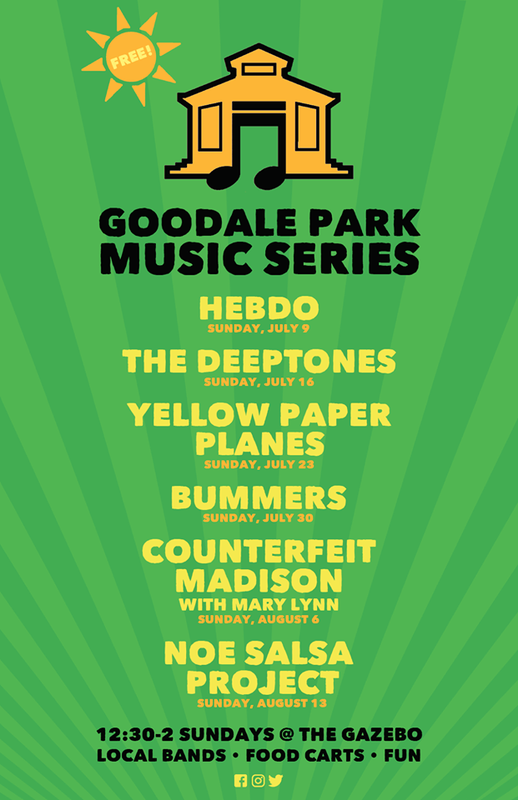 The lineup for this year’s Goodale Park Music Series is here! Join us for the eighth year of our series of six free concerts, with some amazing local performers. SCREEN ON THE GREEN LINEUP 2017!!! The Short North Civic Associationwill launch the 9th season of Screen on the Green on July 21st. This will be the first of three outdoor movie nights held on a 30-foot screen at the softball diamond in the southwest corner of Goodale Park. All movies begin at sundown and will be preceded by a half hour of classic cartoons or shorts. Each film will also feature themed contests and activities that encourage audience participation. Details about these fun interactive elements will be shared two weeks before each screening. A variety of food trucks and carts will sell refreshments, and Hubbard Mastery School will be back with a bake sale to benefit their PTO. Attendees are encouraged to bring blankets, lawn chairs, and flashlights. There are no rain dates. Screen on the Green is free and open to the public. It is made possible through organization and major funding by the Short North Civic Association, with additional funding by the Gateway Film Center, Short North Foundation, Columbus Recreation and Parks Department, and ComFest.